If you own a Coldmaster crock, you need a commercial pump that fits on top of the salad crock. With the Carlisle Coldmaster 1 oz. 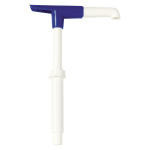 maxi pump, this fixed nozzle pump dispenses 1 oz. per stroke and has flow back design that prevents messy dripping.